In these uncertain times we all have to make every penny count, one way we can do this is to budget the household food bills and stick to a budget. By cooking at home we can go a long way to saving money. Make a list of all your monthly outgoings. Include yearly and quarterly bills and divide out the cost of these for each month. Take this figure from your total income and this is how much money you have to live on – in other words to feed your family and keep your home clean. You will need to purchase cleaning items each month so take a look at the supermarket own brands. Can you see how much cheaper it is to purchase a packet of washing powder with this brand as compared with a major washing powder supplier? Try this powder – it cleans as well as any other brand and can save you at least one pound per box! The same with toilet paper, the average supermarket own label is around forty pence – again a saving of around one pound for four rolls. With these savings you can feed your family – what would you rather be doing, having home major brand cleaning products in your cupboard and not being able to feed your family or being able to put good quality food on your dining table? Many people are worried what visitors will think if they see cheap branded toilet paper or washing products in the home. Why not keep a well known brand of toilet paper in the cupboard and swap when visitors turn up? Decant your washing powder and conditioner into containers or better still keep a box of a well known brand powder or liquid and decant the cheaper versions into it and fool your visitors! Plan you meals for the week and try to cook a few meals in the oven at the same time. You will save electricity or gas on the cooking time and will also find that by bulk cooking you can often make three meals out of ingredients you usually purchase to cover two meals. Use cheaper cuts of meat and use them in stews and casseroles. Try own branded foods. It may be that your family notice the difference in supermarket own branded foods like beans and tomatoes so use these products when cooking – they will not notice the difference. 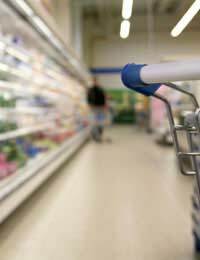 Visit the supermarket at the end of the day and look out for marked down goods. Every store has a section for foodstuff that has reached its sell by date. Don’t be proud, dive in and find some food and household goods for your family. Look for special priced items and buy three for the price of two offers and stock your cupboard. Make a game of filling your cupboards with cut price food and think of it as beating the system. Aim to have at least one month’s worth of meals in your freezer and a cupboard full of the essential cleaning products. Cut vouchers out of newspapers and magazines and use them when shopping. It is easy to cut your shopping bill by ten percent this way. Supermarkets own magazines often have vouchers inside their pages. You can pick up lots of these magazines and use the vouchers every time you shop! With a little thought you can feed your family without breaking the bank.